Across the globe, Apple launched the iPhone 4 in five countries Thursday, generating long lines and unparalleled buzz, as only an Apple product launch can do. As lines outside of Apple's retail stores in the U.S. snaked further back, the wait time for hopeful phone purchasers also grew. At the Westchester Mall in White Plains, New York, hundreds of people were lined up before the store opened at 7 a.m. Frustration in the line grew, however, after the store opened, when the store began taking just two customers at a time, and engaged in a lengthy setup process with all of them. The store also merged the preorder and purchase lines, meaning some who didn't have a reservation got their handset before others who reserved an iPhone 4. At the Miami Beach Apple store on Lincoln Road, the reservation line had between 200 and 300 people by the 7 a.m. store opening time, according to Bridget Carey of The Miami Herald. The line was just as long for those customers without a reservation, and many of them were turned away due to limited availability. Demand has been an issue for Apple's iPhone 4 launch since last week, when the company began accepting preorders. An influx of customers attempting to purchase the handset from both Apple and AT&T, its exclusive carrier in the U.S., caused a number of issues on the first day of preorders last Tuesday. AT&T's verification system for existing customers experienced failure, and Apple was forced to begin rejecting callers from its 800-MY-APPLE number. Despite customers' frustrations, all signs point to the iPhone 4 launch being a tremendous success for Apple. The company revealed that the first day of preorders alone garnered 600,000 sales. 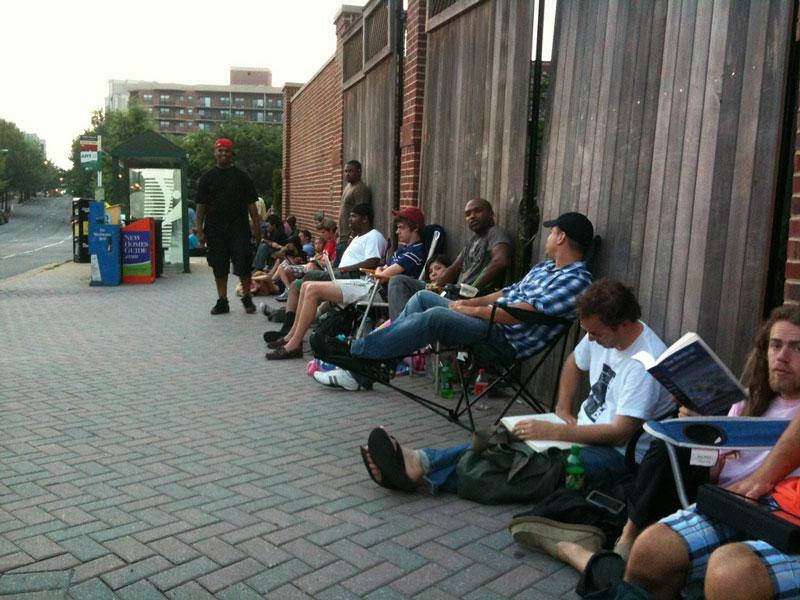 Customers wait outside the Apple store in Clarendon, Va. Photo via Flickr user blakespot. To ensure they would get an iPhone 4, some began camping out in front of Apple stores a week ago, and by Wednesday crowds had already grown outside stores like the iconic Fifth Avenue glass cube. Some reserved their phone for pickup, while others were simply hoping to buy one after Apple sold through its initial allotment of shipments. Some customers who prepurchased were lucky enough to receive the device on Wednesday, as Apple uncharacteristically allowed the devices to be delivered before the official launch date. Many speculated the decision was made to prevent servers from crashing by spreading out activations, as hundreds of thousands of iPhone 4 customers would attempt to turn on their new device in a single day. Those who didn't brave the lines on Thursday may have to wait some time for the iPhone 4, as new orders from Apple are scheduled to ship by July 14. In addition, AT&T expects to have more devices available on June 29. And those waiting for the white iPhone 4 will have to wait until late July, as Apple said that the device proved "more challenging to manufacture than expected."